Sparreholm Castle (Sparreholm Slott) is one of the hundreds of manor homes that wealthy land owners once built in the Swedish countryside around Stockholm. Over the years, Sparreholm has undergone significant changes in both its physical appearance and its use. While this is true of many Swedish manor homes, Sparreholm’s automobile, jukebox, bicycle, and carriage collections make it a particularly apt place to consider how the way we live has changed over the decades. Sparreholm’s history goes back 400 years. However, the current “castle” (it’s a manor, not a castle) wasn’t constructed until 1763 and then was rebuilt or extensively remodeled on several occasions. What exists today is the result of many changes in both the building and its use over time. The original Sparreholm was built in 1632 on property owned by the Sparre family since the 1580s. When built, the manor was named for the area in which it was located. Ten years later the builder, Göran Bengtsson Sparre, named it for his family. Following his death in 1657, the property transferred to his brother’s family. (Marrying the maid – a beautiful woman whose parents hadn’t been married – meant their children couldn’t inherit the property. But the wife of his deceased brother could.) Sparreholm remained in the Sparre family for another 100 years. That house didn’t last very long. When she married Johan Vilhelm Sprengporten he had the wooden house torn down to construct a similar stone structure. In 1763 construction was completed on the structure we know today as Sparreholm Castle. The family renovated the manor in the 1820s to add the Empire features seen today. Sparreholm Castle was sold in 1887 to a couple that seems to have had little interest in it. It was sold again in 1892. Now in the hands of Emil Dickson, the manor was renovated once again. After being lovingly cared for by Dickson, the manor passed to his daughter in 1950. Unfortunately, she seems to have had little interest in Sparreholm. Under her ownership it was used as a women’s spiritual retreat and study center and later as a nursing home. The family sold it to an institute for economic research in 1980. The Karinen family purchased Sparreholm Castle in 1996. They renovated and restored historic buildings and the surrounding grounds, turned outbuildings into museums, and constructed a major equestrian center. And now much of it is open to the public. Today the sweeping driveway at Sparreholm Castle leads to the beautifully restored manor house. Inside, the house has a dramatic dining room with an impressive wood ceiling. It would be perfect for an elegant dinner, but I’m drawn to the drawing rooms. There are two of them, both aligned along the windows at the back of the house. Both are casually elegant. Cheerful fabric on the chairs and wallpaper blends with the elaborate gilt furnishings and silk carpets to create rooms that are both elegant and welcoming. I wish I knew how much of what I’m seeing was already there when the Karinens purchased the house and how much they created. 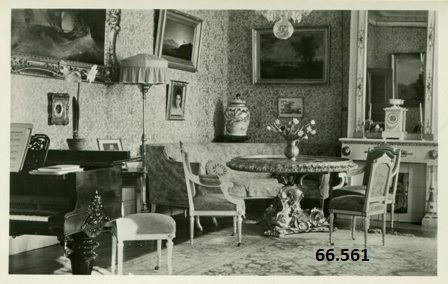 A postcard from the days when the Saint Katharina Foundation held women’s retreats here shows the second drawing room pictured above. In the postcard the furnishings seem dated for the time (probably in the 1950s). I suspect most of them remained in the house from Mr. Dickson’s years there. While a bit stuffier than the room today, much remains the same. Today’s wallpaper matches that in the postcard, a piano still fills one end of the room, the white fireplace with its gilt mirror still stands along the opposite end, even the visible bit of chandelier looks the same. It’s as if the rather tired historic interior was simply freshened up a bit to become something that is at once both modern and historic. Whatever the reality, the results are splendid. There is one other part of the house I fell in love with – the main stairway. Located directly under the cupola, the space draws the eye up to the second floor and beyond. Large windows that brighten the ceiling and second floor balcony give it the feel of an open courtyard. The space is wonderful from below, on the stairs, or along the balcony. It’s a beautifully done bit of architecture. It’s a good thing the bedrooms are equally welcoming, or guests might never leave the balcony! As you can see, the bedrooms are in use. Sparreholm Castle takes overnight guests again, although you can’t just drop in any time and spend the night. It seems worth a bit of advance planning though, as it would it be a dreamy place to spend a night or two. You can only imagine how the buildings at Sparreholm Castle actually looked as they changed over time. However, the manor’s collections of automobiles, jukeboxes, bicycles, and carriages make it possible to see exactly how they changed from year to year. More than a century of automotive history is on display in the Sparreholm Car Museum. The story of the automobile is told through about 60 cars and a mind-boggling array of accessories and vintage signs. And, should you tire of all things automotive, models of vintage planes hang along the ceiling. The Sparreholm Car Museum’s collection was put together by Helge Karinen. He used to guide visitors through the collection himself. It would have been great to hear his stories, but his grandson served as a very able surrogate on my visit. He took us through the collection and highlighted vehicles with particularly interesting histories while answering questions in great detail. Clearly he inherited some of his grandfather’s love for these vehicles. Among the rarities on display are cars that once belonged to Swedish kings, a Mercedes version of something that looks like a Volkswagen Beetle gone bad (it actually predates the Beetle, as the same designer worked on both cars), and some of the most beautiful roadsters ever made. While the cars at the Sparreholm Car Museum are impressive in and of themselves, I really like the way they are accessorized with vintage coats, bags, sunglasses, picnic baskets, and even a bag of golf clubs! It reminds us that (most of) these were cars that people actually drove. They weren’t designed to be displayed like a piece of art. It also makes me curious about the people who once owned these cars and the world they knew. After all, cars aren’t the only thing that has changed over time! I’m not quite sure why Sparreholm Castle’s display of music boxes, phonographs, record players, and jukeboxes is called the Technical Museum, but it’s wonderful anyway. The collection is mostly chronological, beginning with the earliest machines capable of playing “recorded” music. It’s a fascinating assortment of machines that could read disks, cylinders, paper rolls, and more. From there the collection moves on to jukeboxes of all vintages. Again we begin with the earliest technology before moving into the farthest reaches of the attic-like space. There we find a room filled with the elaborate creations that marked the end of the jukebox era. It’s a bit overwhelming, but fascinating and a lot of fun. Our guide even plays tunes on a few so we can dance around the crowded aisles for a few minutes! While it’s not mentioned on the webpage, Sparreholm Castle also has an impressive collection of historic bicycles. The collection includes bikes from all eras, but many are from the 19th century. It’s amazing to see how many variations there are of what seems like a simple concept. I didn’t realize the evolution of the bicycle was so complicated! I didn’t get to see the Horse Carriage Museum, which is located at the Horse Center. The museum displays carriages, sleighs, wagons, harnesses, and saddles from the 1700s through the 1940s. I suspect that, like the Car Museum, the carriages are also accessorized with period items that help bring a long lost world to life. 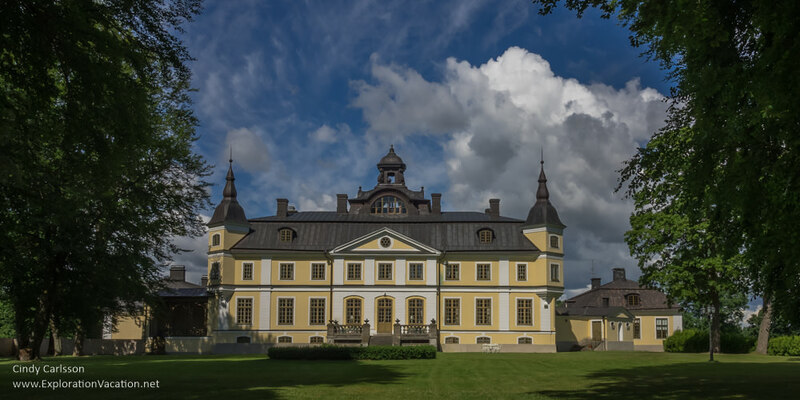 Sparreholm Castle is located in the lovely countryside of Södermanland (or just Sörmland) just southwest of Stockholm, making it an easy day or weekend trip from Stockholm. Södermanland is known for its castles and manor houses, so your itinerary could include several historic properties. Driving time to Sparreholm from Stockholm is about 1½ hours. It’s about two hours from Stockholm’s Arlanda Airport and 45 minutes from Nyköping’s Skavsta Airport. Although Sparreholm Castle (the manor house) is not generally open for tours, you can live there for a night or two as part of a special event or weekend activity. The manor house, grounds, and Horse Center can be reserved for special events of all types. Sparreholm also occasionally offers weekend museum and castle packages. These include guided tours of the museums and other collections (there are telephones, toys, and more that are not part of the museums), meals, and lodging in the manor or one of its wings. For riders, there are also weekend riding packages that include dressage lessons with the Horse Center’s Lusitano horses, a tour of the Carriage Museum, meals, and lodging. The Sparreholm Castle Café serves a selection of light lunch items in a simple room swathed in vintage signs. The food is nice and not as retro as the space in which it is served. The café is open Tuesday-Sunday from mid-June through the end of August. During summer the Sparreholm Castle museums are open during the afternoon on Tuesday-Sunday. The Car Museum may be visited at any time during those hours, although guided tours are also offered each day. The Technical museum is only open for guided tours, currently offered at 2 pm. The Carriage Museum can only be visited as part of a guided tour and must be booked in advance. During spring and fall the museums are open only for guided tours that have been reserved in advance. All of Sparreholm Castle’s museums are closed during the winter. 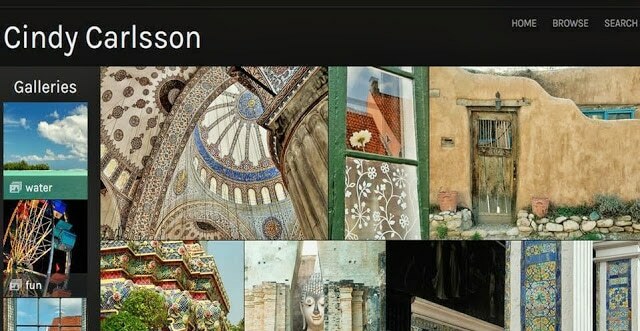 Fees vary depending on the number of museums visited. There is an additional fee for private guided tours. Sadly, we didn’t have time to visit Sparreholm’s Horse Center. Apparently this is one of the finest training facilities in Europe. I don’t ride, but I wanted to see it because it is also home to some beautiful (and beautifully trained) Portuguese Lusitano horses. The Horse Center offers training, classes, special events, and lectures. The facility includes indoor and outdoor riding arenas, racing tracks, and meeting rooms. Lodging is also available at the Horse Center, as well as at Sparreholm Castle itself. I had a wonderful visit at Sparreholm Castle as a guest of Sparreholm, Visit Sweden, and Visit Sörmland. However, as always, views expressed here are strictly my own. Sparreholm Castle looks lovely. I’d love to go when I was able to see the manor house, but the museums look interesting enough to visit even without a look through the manor house. How cool it would be to actually stay there. Sparreholm manor is really lovely, but there are a number of manor houses in this part of Sweden, so the museums are what make it stand out for me. Having said that, they did do a gorgeous job at decorating and I think actually staying in the manor house would be absolutely amazing. Thanks for stopping by, Donna. Ah, your photos of Sparreholm Castle are gorgeous! I have very good memories about this particular manor. I was so impressed about their vast collection of cars and music boxes. Very comprehensive post. Thank you! I agree that those collections really make it stand out.